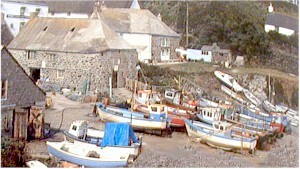 Cadgwith is a small fishing village on the eastern coast of the Lizard Peninsula, just north of the Lizard . The double cove has a swimming and fishing beach separated by rocks called The Toden. A dog ban is in place on South Cadgwith cove between Easter and October. Dogs are welcome on East Cadgwith beach all year.